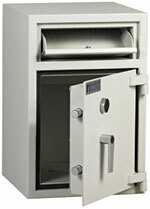 CR4000 hopper deposit safes are designed for shops and businesses where quick and easy deposit access is required without opening the safe door. Hopper is protected with an anti-fishing device to prevent unauthorised removal. Secured with high security double bitted key lock (2 keys). Key lock is protected by a live relocker. High grade solid infill construction design for added security. Anti-drill deflector plates covering bolt sockets.